Samsung is trying its best to sell the Galaxy S5 by all means possible. First, we saw huge price drops for the Galaxy S5 and then the buyback schemes for existing Galaxy S3 users. 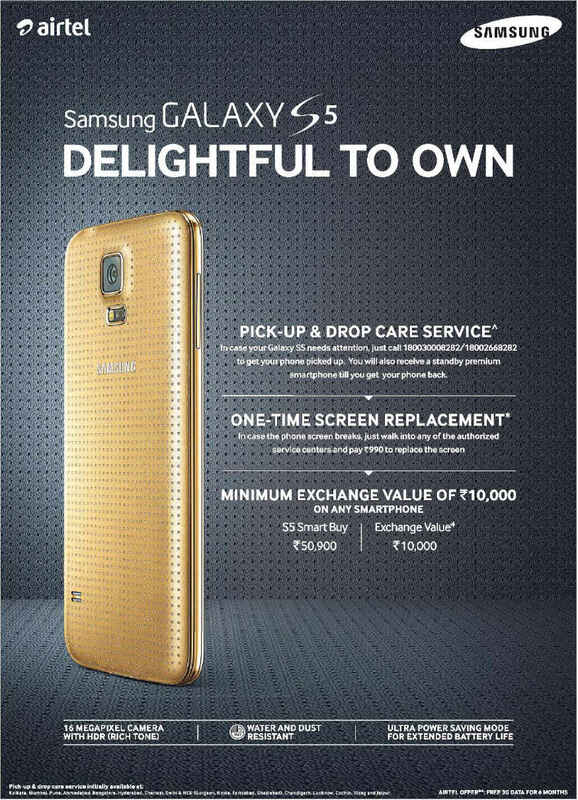 Samsung is offering free pick-up for servicing to the Galaxy S5 users. They are also offering one time screen replacement for just Rs 990. Samsung Galaxy S5 users can just call 180030008282 or 18002668282 to initiate a free pick-up from Samsung. They will also provide you a premium sandy device till you get your phone serviced. To refresh your memory, the Samsung Galaxy S5 comes with a 5.1 inch 1080p Super AMOLED screen, octal-core processor, 2 GB of RAM, 16 GB of internal storage, finger-print security and comes with Android 4.4.2 KitKat pre-loaded. It is water and dust resistant and has an ultra power saving mode. In the initial reviews, experts have praised its camera and display. Although the battery life of the Exynos 5 (octal-core) unit which is on sale in India isn’t as good as the Snapdragon 801 version which is on sale in 4G LTE markets like US and UK.